shhh...nobody tell him he has to do more than this to actually veto something. Graham seems to think that there are supposed to be an equal number of investigations of Republicans and Democrats. What a stupid argument. It's the kind of thing I would expect to hear from a child who just got caught doing something wrong -- or from the man-baby in the White House. This is fake. Right? Seriously? WTF? The scholars that responded to the survey said that of all 44 presidents*, Franklin D. Roosevelt had the best first year in office followed by Washington and Lyndon Johnson. Donald Trump is named as the president whose first year in office was the worst followed by Andrew Johnson and George W. Bush. You know it's a bad first year in office when it's considered worse than the guy who saw the World Trade Center destroyed by terrorists during his first year. How about one of the best first years starting when your immediate superior gets his head blown off? Not sure why anyone would tune in to Cuomo in the first place. Cuomo's show is nothing more than political version of TMZ. Kellyanne Conway is on because people love to watch drama and Cuomo is all to happy to oblige. This is what happens when a Presidents spews hate on a daily basis. This is happening often enough that I think we need a word for it. MAGAttack? Has he mentioned that "there were fine people on both sides" yet? Although as an atheist, I am Jewish only in the ancestral sense, I guess I was a Jexodite 39 years ago when I said "bye-bye" to the Democrats for good (voted for Dems for president and just about everything from '68, to '76). If only there were a word with deep ties to Jewish heritage that was similar to “Jexodus.” Maybe one those signed Bibles could have had the answer. .....THIS SHOULD NEVER HAPPEN TO A PRESIDENT AGAIN! Once you're out of office, it probably never will. He likes to have both sides on but Conway is so intellectually dishonest I never waste anytime watching her. The last time I did watch her she must have used the line "how dare you" at least a dozen times when she didn't want to answer the question. Decided right there and then that she simply is not worth a second of my time. 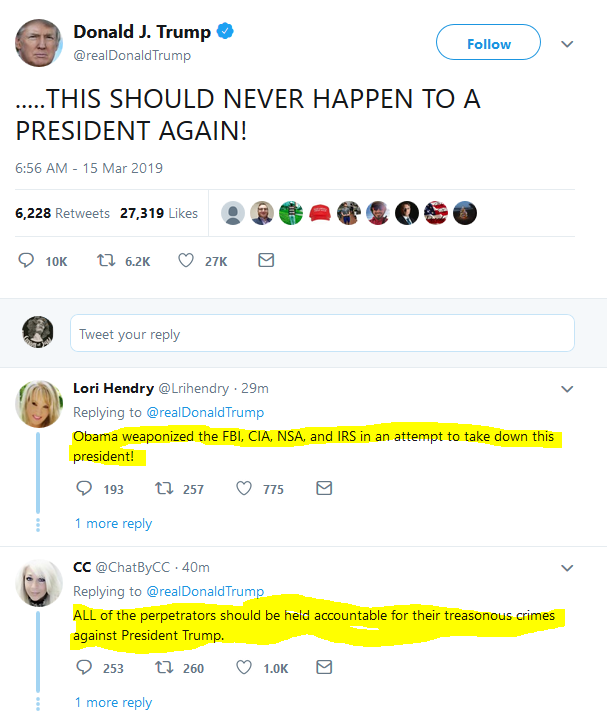 I love the fake account bimbots that always wind up right on top of the replies to Trump's post. Who actually believes those accounts and avatars are real. Who actually believes those accounts and avatars are real. Do you want an answer? Trump supporters. And just like the Exodus, it will never happen.